DAYTONA BEACH, Fla. – The JTG Daugherty Racing team arrives at Daytona International Speedway celebrating its 25th anniversary in NASCAR with a new lineup, high hopes and renewed motivation. Former NASCAR Xfinity Series champion Chris Buescher drives the JTG team’s No. 37 Chevrolet Camaro ZL1 and this year will team with journeyman rookie Ryan Preece in the No. 47 Chevy. 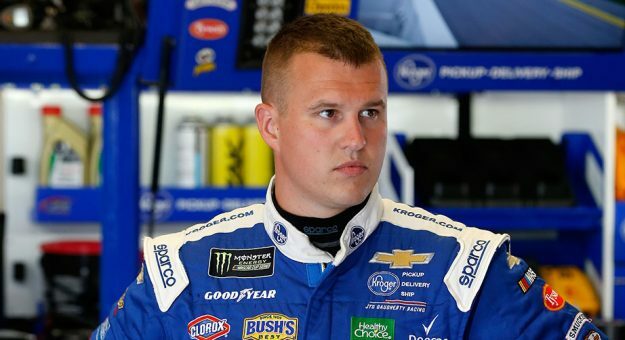 And while JTG is eager to challenge for its second Monster Energy NASCAR Cup Series Playoff appearance – it’s also realistic about the learning curve of its young drivers. The team earned its first and only Cup victory with driver AJ Allmendinger at Watkins Glen in 2014 and there is a distinct and deliberate urgency to answer the Victory Lane toast. It’s been a steady evolution for the team, whose first NASCAR race was in 1995 with driver Jeff Fuller in the Xfinity Series. The team’s first shop in small town Waxhaw, North Carolina – located three miles from the South Carolina border – was a family garage that doubled as a chicken house. The fortunes, goals and expectations of the group have risen notably. It’s been a positive vibe for the JTG Daugherty Racing team to look back on its humble beginnings and see the growth and promise. “Calling our first shop a chicken house is probably generous because I would call it more like a chicken coop,” team co-owner Jodi Geschickter said. “Our small office was on the other side of the chickens. Sometimes you could hear them in the ductwork. Her husband, fellow team principle Tad Geschickter, smiled Saturday morning recalling those early days. Seven-time Monster Energy NASCAR Cup Series champion Jimmie Johnson made his very first NASCAR start for the team in 1998 – finishing 25th in the Xfinity Series race at Indianapolis Raceway Park. He ran one more race, finishing 15th at Gateway Motorsports Park in Illinois two months later. “First of all, I’m so surprised to hear it has been 25 years,” the seven-time Cup champion Johnson said. “They (Tad and Jodi) are two amazing people that have given so many young drivers, crew members an opportunity in the sport; helped us evolve. I’ve watched them grow from the Busch Series (NASCAR Xfinity Series) ranks into Cup and got to see their victory in Cup. This season the Hendrick Motorsports-affiliated organization would love to celebrate the team’s milestone in good form – running up front. Weekly. Its first test of the year is Sunday with pole qualifying at 12:15 p.m. ET (FOX, MRN, SiriusXM NASCAR Radio) for the Feb. 17 Daytona 500 (2:30 p.m. ET on FOX, MRN, SiriusXM NASCAR Radio). Its 2019 drivers certainly bring solid credentials. Buescher is the 2015 Xfinity Series champion and he won a Cup race at Pocono in 2016 for the Front Row Motorsports team. Preece, a 28-year old Connecticut native and former NASCAR Whelen Modified Tour champion, will contend for Sunoco Rookie of the Year honors. His first full season experience in Cup begins in the most prestigious race of the year. He made five starts in 2015 in the No. 98 Curb-Agajanian car – with a best finish of 32nd in his very first race and at his hometown track, New Hampshire Motor Speedway. He holds no false illusions about the learning curve, but he’s eager and prepared. DEBATE: Who will take home Sunoco Rookie honors in 2019? “Well, Daytona in a Cup car is going to be different,” Preece said smiling Saturday morning. “You race against drivers that have been here for a while. So they obviously have got a lot of experience with it. Just get laps and get as ready as you can be for the Duels and use the Duels as something to prepare yourself for the 500. Certainly during his two and a half decades fielding a NASCAR team, Geschickter has seen the sport ebb and flow. He is especially optimistic about his current driver lineup and the team’s affiliation with Hendrick Motorsports. If nothing else, his tenure in NASCAR has given him perspective. “I think everyone knows we’ve got to continue to evolve and change,” Geschickter said. “I see that work going on earnestly. There’s nothing to it now so people assume well, we’re not doing anything, but I had more meetings downtown and at the R&D Center this winter than I’ve had in five years, total.